Use this series to strengthen, through practice, a solid understanding of the word families. Fifteen words familes, with two works for each. 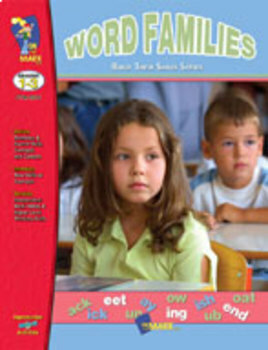 Word Families covered: ad, at, et, ip, ot, ug, ain, ame, ave, ell, ick, ide, ock, unk, ight. Each book contains high-interest work sheets that make reviewing skills easy! The skill focus is printed on the bottom of each page, and a complete answer key in included.